"A naked male, dead in an alley with bullets that make no sense. Fingerprints burned away, tattoos completely removed and a note, written in 13th Century Latin secreted about his person, along with the name and room number of an autistic psychiatric patient. Of all the possible avenues, the last road LAPD detective Nick Lambert wanted was the long drive to Oakdene to interview the girl. It gets much worse when he discovers that as well as being autistic, the girl is also mute. But when an off-hand comment from the nurse piques Nick’s attention, he can’t help but follow the lead. What he finds will slowly turn his entire world - his entire existence - upside down. Nick suddenly finds himself at the heart of a centuries old struggle to find - and hide - the kind of valuable information that mankind should never, ever be allowed to possess. It is only when Nick realises that he was a key player in the game long before it started that he will discover the true importance of those around him. Nick has inadvertently stumbled into the most important human being who ever lived. One who will not only change the world once, but will do it over and over again. He will discover many things about the girl... What she has to hide is the most important thing of all." this marvellous, stupendously, fantastic book with. 12 O’clock at night reading it. is to miss a super book of brilliant possibilities. dialogue was actually very fun. is such an amazing person. 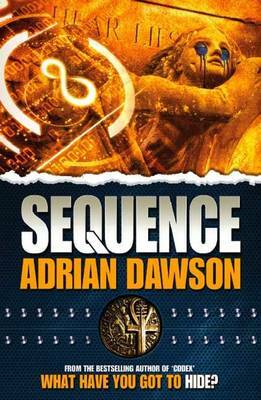 I am so glad that you found Sequence a great read, I'll admit that it wasn't the easiest to write, but I do believe, and based on your review I guess so do you, that the balance of action, interaction, pace and characters were a good combination. If you, or any of your readers, have any queries or questions on Sequence, or indeed my earlier novel Codex, please feel free to contact me via my website.